When retro is new again (Pineapple Upside Down Cake in a Skillet) | Krystal cooks. Over the weekend we celebrated my littlest sister and her 19th year. Yes, my sister is entering into her last teen year. I just can’t believe it. She’ll always be my baby sister though. After all, when I’m 99 she’ll only be 89. Spring chicken! 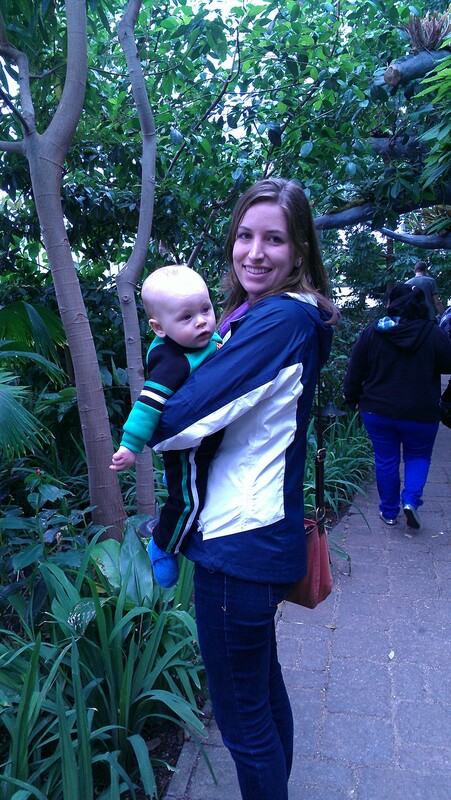 My baby sister and my baby boy. To celebrate her birthday, we went to the zoo and then made any cake she wanted. She could have chosen a chocolate cake with chocolate ganache and chocolate ice cream. Or a lemon infused three-tiered cake with butter cream frosting. But no, she chose pineapple upside-down cake. And when I told her she was being retro and a little bit too easy on me she blinked back at me confused. 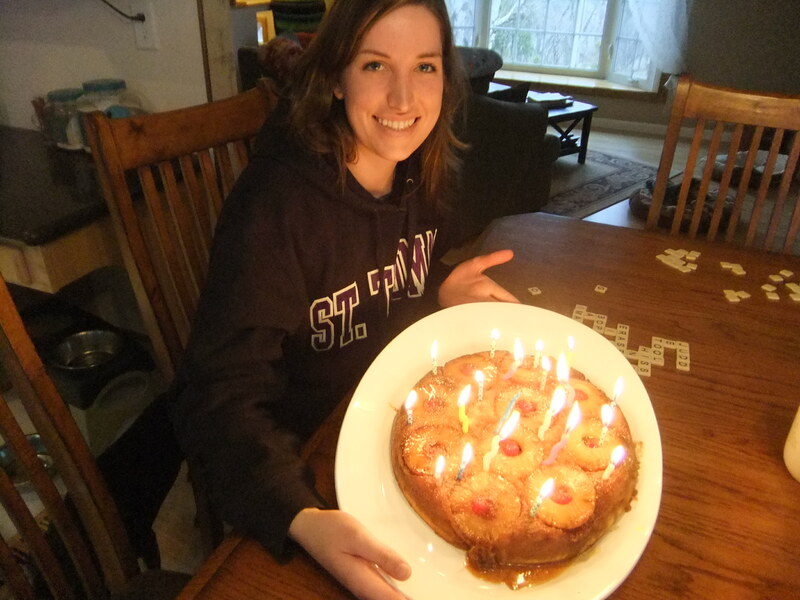 Apparently 19 is too young to know that a pineapple upside-down cake is old-school. Making the cake batter is fairly easy – especially since you can just dump all of the batter ingredients into a bowl and mix. Preparing the pineapple base does take a little time, but I would never call it difficult. The hardest part of this recipe is doing the flip. You know, turning it into an “upside down cake.” Mine came out easy, but it’s a heavy pan to flip and it’s pretty nerve-racking. My cake looked just beautiful, but I did need to nudge a pineapple or cherry back into place. 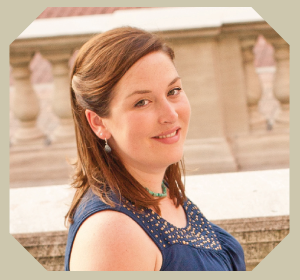 I always have a love/hate relationship with Pioneer Woman’s cookbook. I love all the photos, but they’re fairly teeny anyhow and I find it irritating to have the recipe wrap across two pages. This one isn’t really that big of a deal since it’s across a spread, but sometimes you have to flip the pages back and forth. My hands are usually dirty or busy while I’m cooking, so flipping pages is a huge pain. One other small irritation I had was that it didn’t say how to handle the half a stick of butter you put into the cake batter. Is it chilled, melted, softened? I used chilled butter and had huge chunks of butter in the batter. It melted while it baked and the cake turned out perfectly. So – go ahead and use chilled butter! The cake was very yummy, but the flavor didn’t really rock my world. I would have been just as happy with a box mix cake. It was moist and sweet and not at all dry. But the icing on the cake in this cake comes in the form of butter, brown sugar, and pineapple. The candied pineapples were delicious and I happen to think the pop of color and sweetness from the cherries were a much-needed boost. My cake overflowed a little, so make sure you put a old cookie sheet underneath the cake to catch any drippings. 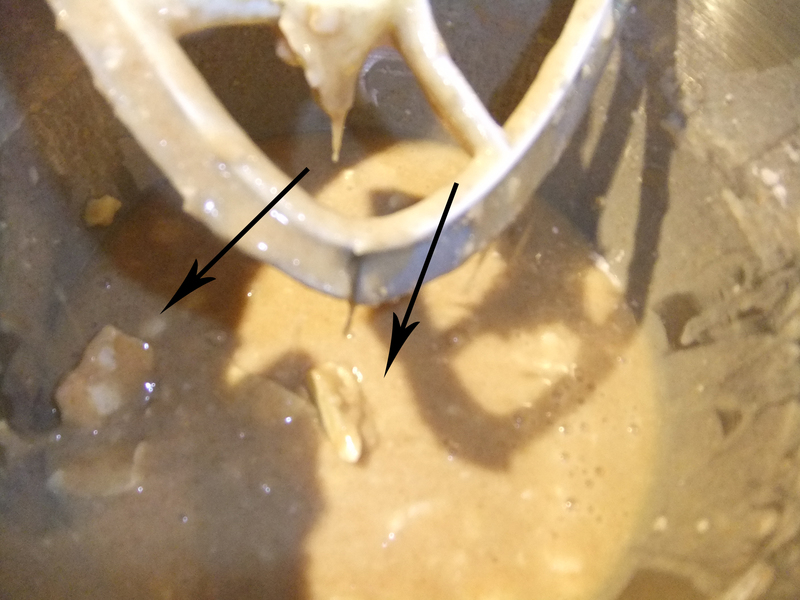 I think the clean up for this is loads easier than the clean up with a usual cake recipe. Basically all there is to clean is a mixing bowl and a skillet. 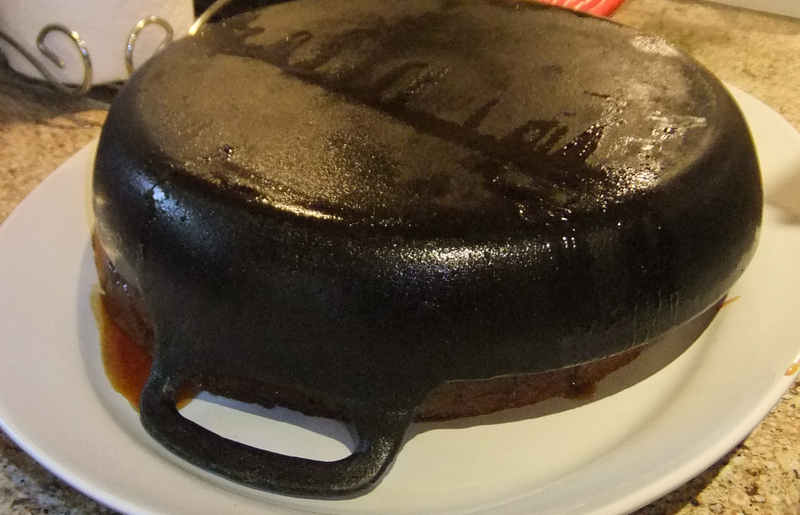 And the skillet just needed a quick rinse (don’t scrub or soap your cast iron skillets please!). With a traditional cake there is always a fair amount of cleaning to get the baked on cake off of the pan, well not the case with this one. Half a stick of butter melted on the skillet will do that. Since this is a retro recipe, you can count on it making the most of a buck. It has a charming and colorful presentation, but nothing showy or expensive. 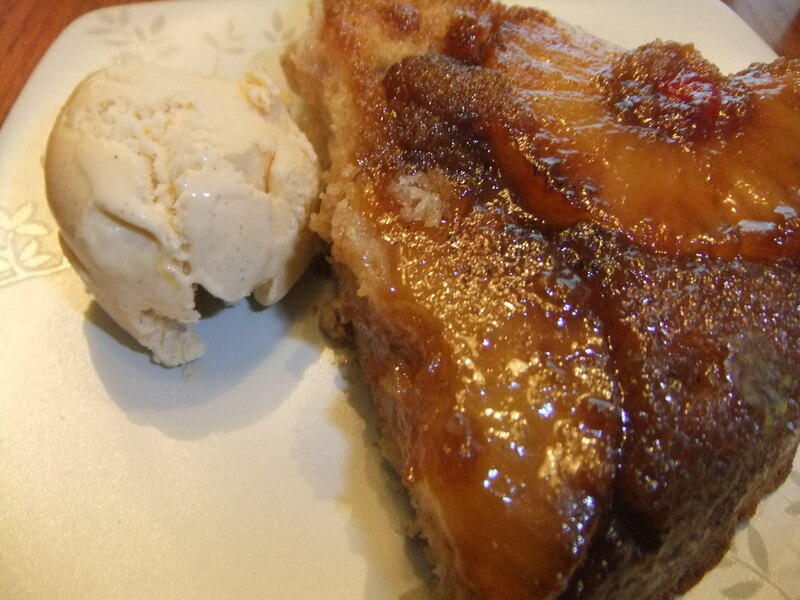 I served it with cinnamon ice cream, but vanilla would work just as well! 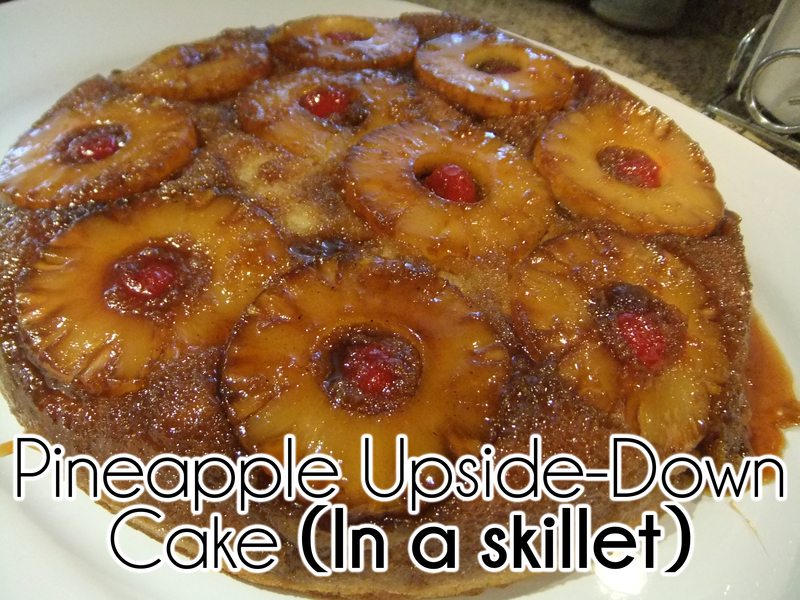 Have you ever made pineapple upside-down cake? 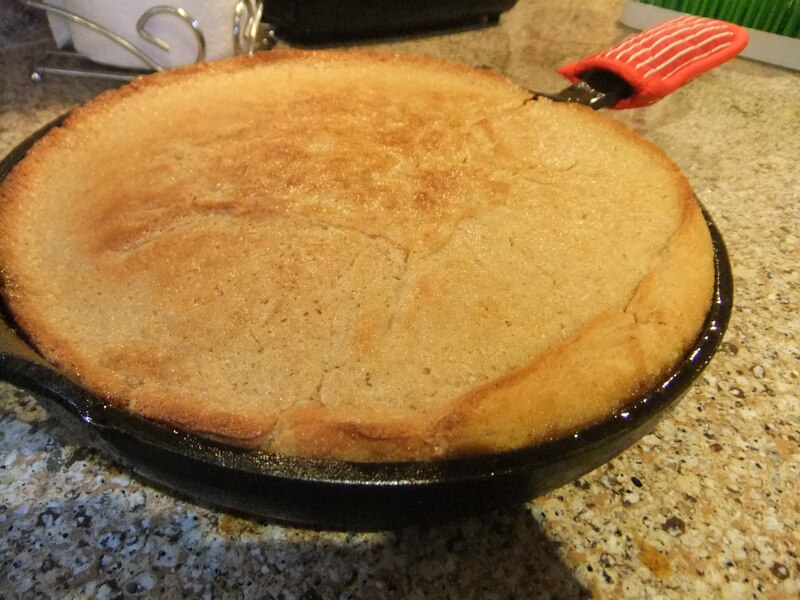 Do you own a cast iron skillet, and if so, what do you cook in it? This is so funny. Grandma did make this recipe all the time! I did like it, but would have chosen the double chocolate. Me too! I’ll remember this recipe for a quick dessert though. It was easy to make and a cute presentation.